Eurovision 2017: How the Contest missed out a Lady Gaga performance. According to local media reports in Ukraine Lady Gaga was to perform om Eurovision 2017 stage but was eventually replaced by Ruslana! Eventually, instead of Lady Gaga we saw the Eurovision 2004 winner, Ruslana, on stage. The Ukrainian artist performed her new song «It’s Magical» and alongside Jamala and ONUKA, were the guest artists of the grand final. True or not , the Eurovision Song Contest seems to be attracting progressively more international artist’s interest , a development that seems rational considering the global dimension the contest’s impact . 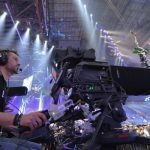 Eurovision 2018: Ruslana on the Eurovision Stage again! Eurovision 2017: This year’s contest in T.V viewing figures.